Democracy hotel has several rooms to choose from: deluxe rooms, standard rooms and executive suites. All our rooms are equipped with classic wooden furniture, work-desk, air-conditioning units (with remote control), color television with satellite cable (and your choice of many international channels), broadband and wireless internet access, alarm clock, in-room safe, bathroom with hot water shower and refrigerator. We offer complimentary tea/coffee, fresh fruit plate (daily)Â for your convenience. In our hotel lobby, our customers may use our public computers which are loaded with Internet explorer, MS Word and Powerpoint. Free pick up service from local bus and train stations , with a 3 nights stay FREE PICK UP FROM AIRPORT. 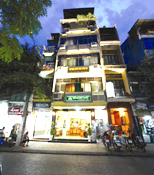 Democracy hotel was founded in the 70s and is regularly renovated. With over 30 years of experience, we are committed to providing quality accommodation and comprehensive travel services for Viet Nam as well as Southeast Asian countries (including Thailand, Lao and Cambodia). Democracy hotel comes highly recommended by many tourists. With clean and comfortable rooms and our professional, friendly and helpful staffs, we are confident that you will appreciate your stay in Ha Noi. We also offer tourist assistance 24 hours a day, 7 days a week, as well as tour bookings at competitive prices. Relax and enjoy your stay at Democracy hotel!